The Glock slide provides for lockup of the barrel’s chamber area into the ejection port, which is cut low on the starboard side. The pivoting extractor is massive and is powered by a coil spring bearing on a plunger to its rear. Since the Glock design is hammerless, the rear of the slide holds the spring-driven firing pin and the firing pin safety plunger. This plunger assures that the pistol will not fire until the trigger is fully to the rear. 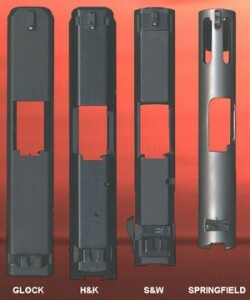 The slide is finished with Glock’s Tenifer™ process, which assures a diamond-hard surface. The finish looks a lot like parkerizing, but is nearly impossible to scratch. The firing pin is rectangular in cross-section, so it’s always easy to spot brass which has been fired in a Glock. The factory sights are 3-dot plastic of the classic Patridge design. Optional, and present on this particular pistol, are metal tritium night sights. This slide is the widest of the four pistols, a tie with the H&K. However, it seems clunkier than the H&K slide, which is scalloped along its forward area and beveled along the top edges. The H&K slide is so similar in dimensions to the Glock that the Glock and H&K barrels will slip into either slide interchangeably. Of course each needs to be mated with the proper barrel, spring and frame to work. The substantial extractor is pivoted around a roll pin, and spring-loaded. It’s longer than that of the Glock, and has its top surface painted red to serve as a loaded-round indicator. The factory sights are metal, 3-dot, and give a good Patridge sight picture. This pistol was retrofitted with tritium sights for night work, but the sight picture is basically identical. The graceful scallops along the forward half of the slide give the illusion that the slide is slimmer than that of the Glock, and there is a certainly a weight savings to be gained. The slide contains the firing pin, firing pin retraction spring, and the firing pin safety mechanism. There is a recess at the rear of the slide for the pistol’s bobbed hammer. The finish is H&K’s all-weather tough and durable matte blue, similar to Glock’s Tenifer™ process. It equals or betters stainless steel in moisture resistance. The Smith & Wesson slide is of blued steel, and features a slide-mounted decocker-safety lever on the left rear, which increases its width about 2/10 of an inch. Instead of the rounded top which characterizes more expensive S&W offerings, this slide utilizes two longitudinal flat bevels. It’s not unattractive, and certainly results in cost savings during manufacture. The long, massive extractor is pivoted, but does not serve as a loaded-chamber indicator. The sights as the pistol comes from the factory are plastic, with the rear being a close imitation of the Novak design. They were replaced on this pistol with Trijicon™ tritium night sights. The slide holds the firing pin, its spring, the rotating safety-decocker lever, a firing pin safety mechanism, and a magazine safety mechanism. This is the only pistol of the four to utilize a magazine safety. The bluing on the slide is with a matte finish, and is not nearly as durable as the finish found on the Glock and H&K pistols. It shows holster wear rather quickly. There is a recess at the rear for the bobbed hammer, which fits flush when the hammer is down. The Springfield’s slide is the classic graceful 1911 design, in stainless steel. The grasping grooves are slanted forward in the modern manner, with 9 flat-bottomed cuts. The ejection port is lowered, almost radically so, and scalloped for better ejection of the expended brass. The two compensator vent ports at the top front of the slide measure about one and 1/10 inch long. This makes for a very light slide. The sights on this one are of the high Patridge design. More recent examples from Springfield feature a Novak rear sight. Originally the sights on this pistol had 3 white dots, but these have been preferentially blacked out by the owner. This slide is of the original (Series 70 type) design, and there is no firing pin safety. The extractor is pure 1911 in which the spring is the extractor itself. The slide also houses the firing pin, its spring, and the firing pin retaining plate. Interestingly, the Springfield .45s use 9mm-size firing pins which are of a lesser diameter than the usual 1911 .45 size. Tritium sights are not a practical option on this pistol, as the compensator’s exhaust ports will quickly blacken the front sight. There is, of course, a recess for the pistol’s commander-style hammer.